I love to teach Stein’s “word portraits.” I begin by asking students to write about the word “portrait”—and we explore some of the common definitions of portraiture (i.e. visual, realistic, focus on a person from the shoulders up, etc.). We then write about what a “completed portrait” might be—delving into the implications of Stein’s title, “If I Told Him: A Completed Portrait of Picasso.” A “completed portrait” often reminds us of a finished painting, something housed in a museum, yet students are often baffled by Stein’s rendering of Picasso. They ask—where is “he” in this portrait? My response—what do we really need to make a portrait out of words? What is the goal of a portrait—for you, for Stein? In “Portraits and Repetition,” Stein describes her turn to portraiture as “I was creating in my writing by simply looking” (113). For students, this statement underscores the value of detail and description in formal writing. But, it also provides students with an example of how one can trust what he or she sees/hears and then translate that into words, rather than rely on outside research and ideas that belong to others. Just as Stein draws a clear distinction between “entity” and “identity,” writing, “I created something out of something without adding anything” (121), students too need to realize that writing centers around one’s own ability (and willingness) to “[make it] contained within the thing I wrote that was them” (118). In other words, Stein’s portraits open the doors for students to understand what it means to look and record—from one’s own lens, painstakingly. When teaching “If I Told Him,” a colleague of mine asked his class to write their own “completed portraits,” of the student in the room they each knew the least. I often ask my students to write their own self-portraits (or auto-portraits). They then exchange auto-portraits anonymously (if possible) and write a new “portrait” of what the reader thinks the writer learned from Stein. Is there a way to write a portrait of the learning process? Can we write to discover what it means to write to discover? Or, "do you do you do you really understand" (Stein 107). Preston, John Hyde. 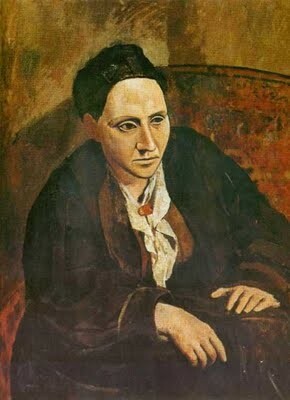 "A Conversation with Gertrude Stein." The Creative Process: A Symposium. Ed. Brewster Ghiselin. Berkeley: University of California, 1952. 164-72. Print. Stein, Gertrude. Look at Me Now and Here I Am: Writings and Lectures, 1911-1945. London: Peter Owen, 2004. Print. Williams, William Carlos. “How to write.” New Directions in Poetry and Prose, 1936. Ed. James Laughlin. New York: New Directions Books, 1986.